Andrew McGregor There is a side of Darfur that does not involve raging conflicts, refugee camps or war crimes. As in so many areas of conflict, such scenes tend to form our full knowledge of these places, representing a loss both for ourselves and the people who live there. Twenty years ago Darfur was nearly unknown outside of Sudan and not even very well-known within it as most Sudanese had never been to Darfur and knew relatively little about it, though all were aware of Darfur’s last Sultan, ‘Ali Dinar, who despite fighting Mahdists, Egyptians and Britons to keep Darfur separate from the rest of the Sudan, had become a kind of national anti-colonial hero whose story was taught in schools across the country.1 However, there is convincing evidence that Darfur was once the centre of a great African civilization, at once a melting pot of regional influences while maintaining a unique multi-tribal, multi-ethnic and multi-linguistic character of its own. Darfur is one of the least examined archaeological regions in the world, yet one so rich in remains that almost any kind of investigation would be sure to reveal lost secrets about the trade in objects and ideas between sub-Saharan Africa and the civilisations of the Mediterranean coast. It was a place whose story was told in the great untouched stone monuments of its dynasties and the oral traditions of its peoples, a story in which the causes of the current violence in Darfur are deeply embedded, as may be their solution. Though not wishing to exoticise this culture, it is relatively easy to cite a number of unusual and intriguing elements of this civilisation: Darfur was a multi-ethnic society bound by elements of a common culture, one in which many of its residents identified nearly as strongly with the idea of the Sultanate as a political and economic entity as they did with their own tribal affiliations. Darfur was a place that practiced elements of a divine kingship, one reflected by the veil worn by the Sultan and the presence of the Kamni, or “Shadow Sultan,” a royal relative accorded the privileged lifestyle of a Sultan, but who was expected to die at the same time and in the same way as the king, even if this meant the use of royal executioners (NachThis paper is largely based on the author’s Darfur (Sudan) in the Age of Stone Architecture c. AD 1000-1750: Problems in historical reconstruction, BAR International Series 1006, 2001. Other treatments of this period can be found in R. S. O’Fahey, The Darfur Sultanate: A History, New York, 2008 and H. G. Balfour Paul, History and Antiquities of Darfur, Sudan Antiquities Service Museum Pamphlet, Khartoum, 1955. See the discussion in McGregor 2001, 34, fn. 25.
displayed at the 1821 Battle of Bara, in which the Fur Sultans lost Kordofan to the forces of the Egyptian Viceroy. In their first encounter with artillery, the Sultan and his horsemen charged the guns so fiercely in their zeal to kill the fire-spitting demons that the cannon bore the marks of their sabres for years after the battle (see McGregor 2001, 75-76). One of the many interesting traditions in Darfur is one in which Dhu el-Qarnayn (Alexander the Great) was the first ruler of the Fur homeland in the Jebel Marra Mountains. This unlikely tradition holds that he built his house at Merri and introduced the date palm to the region, but the story is very much in character with the many Alexandrine romances that recorded the great king’s adventures in the far flung corners of the earth. What is unusual here is the apparently pre-Islamic origin of this tale in Darfur. The sons of Dhu el-Qarnayn are reputed to be buried in barrows near the volcanic lakes of Jebel Marra, which remained an important site of pilgrimage for the Fur into the 20th century (Arkell Papers, SOAS, Box 3/File 12/(Darfur 4)). Finally, the great number of poorly understood antiquities in the region has encouraged various writers and scholars to suggest links between Darfur and Old Kingdom Egypt, the Kingdom of Kush (Meroe) or even the later mediaeval Christian kingdoms of Nubia. Unfortunately, what many of these theories have had in common is an unwillingness on the part of their proponents to believe that the massive stone ruins of the Darfur mountains could actually be the work of an indigenous culture. To the south of Darfur lay the Fertit, pagan African tribes whose enslavement and export by the Darfuris provided the sultanate a rich income. It was also the source of goods from the African interior that were shipped through Darfur to markets on the Mediterranean coast. To the south west lay the important kingdoms of Borno, Bagirmi and Kanem, now parts of Nigeria and Chad. These kingdoms played important roles in the introduction of Islam to Darfur and especially in developing certain phases of Darfur’s architectural heritage, when architects from these regions were brought to work in Darfur due to their knowledge of proper Islamic forms. In practice, this constituted something of a revolution in architectural styles that reflects Darfur’s shift from isolated mountain kingdom to a commercial center with international ties and an important part of the Islamic frontier in Africa. To the west lay a region of smaller border sultanates such as Dar Tama, Dar Qimr and Dar Masalit that formed a barrier between Darfur and its western rival, the Sultanate of Wadai. Despite many historical and cultural similarities the two states were constantly at war, and the perilous position of the border sultanates meant that mobility was a more necessary quality in their royal courts than the construction of permanent administrative and religious structures. The Masalit, however, were formidable warriors in their own right, which helped keep Dar Masalit’s neighbors wary of the small kingdom. Most importantly, we have the Jebel Marra mountain range in the heart of Darfur, an ancient range of well-watered volcanic peaks approximately 3,000m high with a pleasant climate and a traditional abundance of fruit and grains that has endured several droughts in recent years, increasing competition for resources between pastoral Arab tribes and sedentary agriculturalists. Though only 50km wide from east to west and 110km long from north to south, this very human friendly environment has probably been inhabited for thousands of years, but confirmation of this must wait for opportunities for fieldwork. An understanding of Darfur’s strategic location and the routes in and out of Darfur are also important in identifying the cultural influences that helped shape Darfur civilisation. The main trade routes from Darfur generally ran northsouth rather than east-west. Most famous was the north east caravan route to Egypt, the Darb al-Arba’in, or Forty Days Road. Almost directly north lay the difficult and often waterless route to Benghazi through Kufra Oasis, a highly strategic site both then and now. To the north west lay the more favorable route to Tripoli. The route running east through Kordofan to the Nile was little used and extremely difficult until a series of wells and water storage points in Tebeldi trees was created beginning in the 18th century. Even in 1916 the invading Egyptian Army that used this route nearly perished due to thirst and hunger before they fought a single battle. Ironically, the only thing that saved them was the fact that preservation of the wells and Tebeldi trees was regarded as a sacred duty for the Sultan of Darfur. Even faced with an invading army, the Sultan refused to destroy the water network, which would have ensured the destruction of the invaders. The difficulty and rare use of this route in earlier centuries form one of the main arguments against theories that Darfur was the creation of Meroites escaping the Axumite invasion or a western extension of the Christian kingdoms of Nubia in the mediaeval period. temples, the architectural plans of these civilisations and the designs of all those later influenced by them were dominated by the square and the rectangle. Tora stonework is easily identified, consisting of massive masonry, faced on both sides and filled with rubble. Tora buildings are extremely solid and not easily destroyed. The stonework is very distinct from modern Fur stonework, which consists largely of balancing single stones one atop another, with no attempt at facing. The following are a few characteristics of the Tora style, which were adopted with some variations by the better known Daju, Tunjur and Fur dynasties. Somewhere in the shadowy world between mythology and history lie the Tora, the legendary race of “white giants” that are credited in Darfur with the construction of the earliest megalithic stone-works. Oral traditions claim this race of invaders came from the north, suggesting the Tora may have been Berbers from North Africa who crossed the desert, probably passing through the Tubu homeland of Tibesti to reach the moderate and welcoming climes of Darfur’s Jebel Marra. The Tora are credited with introducing: Megalithic construction Advanced stone-working techniques Terrace farming, which enabled Jebel Marra to support a possibly far larger population than it does at present Irrigation techniques The cultivation of palm trees. Multi-chambered structures are found within a massive oval or circular compound wall. Large stone plinths are commonly used. Round casemate cupboards provided storage areas (Plate 2). Terracing of mountain building sites is done with large boulders. Palaces, the largest type of structure, may be as large as 200m to 400m in diameter. The Tora remain the great enigma of Darfur history. Indeed, we cannot even say with any certainty that such a group existed, though if not the Tora, some group was responsible for the megalithic stonework that was already in place by the time the Daju took control of Darfur. Interestingly, there are some sections of the Fur who claim Tora descent despite their legendary status (Arkell Papers, SOAS, Box 3/File 13/ (Darfur 3); Arkell 1937a). Plate 2. Casemate cupboard (From an original photograph in the archive of Glencairn Balfour Paul (EUL MS 370), Special Collections, University of Exeter, by permission of the Estate of Glencairn Balfour Paul). For Tora construction methods, see Balfour Paul 1955, 21.
of grain only to pour the grain out into the sand in front of the taxpayers, were reputed to have brought an end to Daju rule in Darfur. The tale of ordering a mountain to be moved and the story of Ahmad el-Daj’s wild ride on an antelope are examples of recurring motifs in the region’s oral traditions, with the story of the sultan riding west on an antelope appearing in Zaghawa, Tunjur and Fur versions of the tradition, though each version features a different king. These recurring motifs are discussed further below. Until proper archaeological surveys and excavations begin in Darfur, these traditions provide the bulk of what we know about the history of Darfur. There were no written records kept until the Islamic sultanate of the Fur took power in the 17th century, but even these were not readily shared with outsiders. These documents might have provided an abundance of historical information on Darfur, but the royal archives suffered devastation at the hands of the freebooting slave army of Zubayr Pasha in 1874, and then again in the late 19th century during the rule of the Mahdists, who burned any records they could find. Finally in 1916, the invading Egyptian Army threw most of the records they found into the streets of el-Fashir as they looted the Darfur capital after the defeat of Sultan ‘Ali Dinar’s army at the Battle of Beringia. Under the Daju it appears to have become a tradition for each sultan to build his own palatial residence, a practice that continued under different dynasties and has left the region with an astonishing number of important archaeological sites. The typical Daju grave is a long barrow, the most interesting of which may be found at the volcanic Dereiba Lakes in Jebel Marra. As mentioned earlier, these barrows have become identified in Fur oral tradition with the legends of Alexander or Dhu el-Qarnayn, “He of the two Horns,” as he is known in Islamic tradition. In this form he is said to have been the first sultan of Darfur in certain folk traditions in the area, though it is quite certain Alexander never reached remote Darfur. The Dereiba lakes, whose strange atmosphere rarely fail to make an impression on visitors, appear to have formed a highly sacred space from the earliest pre-Islamic times. The barrows at the lakes were a place of pilgrimage until recent times. They appear in a cluster of four, with a smaller fifth barrow nearby. According to a Fur tradition the barrows belonged to the sons of Dhu el-Qarnayn, while the fifth and smaller barrow was said to belong to their dog. Pilgrims typically crawled around the barrows on all fours and would reach into the barrows through a small hole and extract soil to consume after mixing the earth with water. This soil was understood to contain elements of the bodies buried in the barrows. The deep ruts formed by the crawling paths suggest the pilgrimage is a tradition of great antiquity. Sudan & Nubia nexus of important trade routes to Egypt and Tripoli. Some three to five miles in circumference, Uri contains a variety of lifestyles and construction methods consistent with an extended occupation. The area is today so thickly covered with brush that the mosque was not discovered until the 1950s (Figure 1). enormous but useless construction projects, in his case, the leveling of a mountain so he could build a residence on it. The site is still known today as “Mailo Fugo Jurto,” or “the leveled mountain.” (Nachtigal 1971, IV, 276). According to tradition, Shau Dorsid was deposed by his half-brother Dali and fled on a white horse to the mountains of Ennedi in northern Chad, though to this day a small Tunjur group in Dar Inga continue to call themselves “the Showunga,” “the people of Shau Dorsid”. Keeping in mind the recurring motifs in local oral tradition, we can note the similarity with Ahmad el-Daj’s flight west on an antelope and the flight west nearly a century later of the last Tunjur Sultan of Wadai, who also escaped on a white horse after being overthrown by an Arab-Maba coalition (“The Native Chronicle of Wadai,” in Palmer 1928, 26-27). Another important motif in local tradition is the arrival of the “Wise Stranger” who transforms the local culture. The story is common to many ethnic and linguistic groups in the eastern Sahel region – in Darfur the Wise Stranger first appears in Tunjur traditions and is known as Ahmad el-Maqur (Ahmad the Lame) (Nacthigal 1971, IV, 275; O’Fahey and Spaulding 1974, 114; MacMichael 1912, Appendix III, 231234). All these tales have a number of common elements: The Wise Stranger comes to a remote and barbarous land. He introduces new customs (especially associated with eating). The Wise Stranger marries the chief ’s daughter and begins a new dynasty. The tale of the Wise Stranger usually appears to be closely tied to the arrival of Arab or Islamic influences in the region. As such, it became an important element in establishing the legitimacy of a new dynasty. In local tradition, the Wise Stranger actually arrived twice in Darfur, helping establish both the Tunjur and Fur dynasties. Today the Tunjur are found in Darfur, Kanem, Wadai, Ennedi and northern Nigeria. They keep the memory of their once powerful kingdom and their Tunisian origins alive through song, oral tradition and the wearing of the Black Turban of mourning by the Tunjur chief in Darfur. Berber chouchet (“pillbox”) tombs appear to have spread from northern Algeria to the Tunis region and then on into Tibesti and eventually into Darfur, where they appear outside the stone ruins of long-abandoned cities. The introduction of the chouchet style and its abandonment after Tunjur rule may give us an important clue as to the Berber identity of the mysterious Tunjur (see Camps 1991, 1400-1407). Otherwise, in more monumental works, the Tora style continues to appear alongside innovations associated with the introduction of Islam, at least at the highest levels of Tunjur society. Figure 2. ‘Ayn Farah – 1. General plan by de Neufville and Houghton; 2. Plan of the Palace by Balfour Paul. Plate 3. Nubian Christian sherds allegedly from ‘Ayn Farah. site, claiming the mosque was actually a church and part of a large Christian monastery. The problem is that all other aspects of Lady Rugman’s description of the building are inconsistent with what we know of it, including her claim that piles of such sherds were lying about the interior. The site had been visited several times by capable observers prior to Lady Rugman’s alleged visit and no one had ever found any sherds other than those of a rough redware that is still in use in Darfur today, the exception being a sherd of this type bearing a Tunjur brand found by H. A. MacMichael. 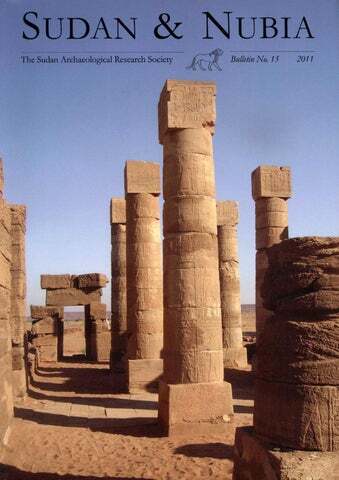 Though Arkell would claim the structure was actually a type of late Nubian church of the 13th or 14th centuries, there is ample evidence against such a claim and there is in the end little reason to revise the tentative dating of the Ayn Farah complex from the more probable 15th or 16th centuries. The greatest argument against Arkell’s identification is the presence of a second mosque at the site, attached to the bayt el-mayram, a practice known from Bornu. The building is simple in form, but is undeniably a mosque and would seem to confirm the identification of the larger worship hall as a mosque and not a church. Though he had noted the presence of this second mosque in an early trip to the site, Arkell never mentioned it again after he began identifying Ayn Farah as a Christian monastery. Just below the second mosque are the remains of several qubba-s, likely used for royal burials. Unlike northern and eastern Sudan, where qubba-s are relatively common, all qubba-s in Darfur have either been demolished or are in ruins, save for the late 19th century qubba of Zakariya, a prominent landmark in el-Fashir (Plate 4). Figure 4. Fur Sultan wearing the Kalamsiyah (crown) – by Balfour Paul. though there may have been other issues; one Fur tradition records that the dispute was between two chiefs, Kuru and Tunsam, over a property in Dar Fia. Despite its name, meaning “Abode of the Fur,” Darfur during the Fur ascendancy was not a typical kingdom representing the supremacy of a single ethnic group over certain of its neighbours. Just as the Fur were not so much a tribe as a collection of various groups that were voluntarily assimilated to the Fur culture and language, Darfur was as much an idea as a territory – a place where various tribes lived in a largely cooperative atmosphere with access to the highest civil and military posts, save the throne, which was reserved for the Kayra Fur. The Fur rulers had a strange relationship with the Arabs and Islam. Unlike many groups that converted to Islam, the Fur never had the same deference to Arabs as the original Muslims or Islamic authorities that other cultures had. Islam had largely arrived in Darfur from fellow Africans in the west rather than Arab missionaries from the east. While the supposed Arab origin of the ruling Kayra Fur clan was part of the clan’s claim to legitimacy, it was never felt necessary to change the language of the court from Fur to Arabic. The Fur never experienced an inferiority complex in their relations with the Arabs; to the contrary, the Arabs in Darfur were little more than unruly and difficult subjects of the Sultan, though in typical Darfur fashion, those willing to work with the regime found ready employment in the army or administration. The adoption of the tale of Ahmad el-Maqur, the Wise Stranger, by the Fur may indicate a closer relationship between the early Fur and the Tunjur than the later Fur were prepared to recognize in the interests of establishing the Fur dynasty as the first Muslim rule of the region. Plate 4. “Secular Qubba” of Sultan Zakariya, 19th century. Sudan & Nubia by a change to imported square or rectangular plans for administrative and religious buildings, though the circular form continues to be the main element in domestic architecture (the tukl). An examination of a few examples of Fur architecture illustrates the development of the Fur style. determination to bring Islam to Darfur as the state religion. This sometimes required extraordinary efforts – traditions record that he personally circumcised many leading chiefs as well as thousands of others with a single razor specially brought from Cairo (de Lauture 1855-56). The Palace of Sulayman Solong The residence of Sulayman Solong, the first sultan of the Fur dynasty, was a return to the round forms of classic Tora architecture (Figure 5). Some of the features include benches, an inner court for the immediate family and an outer court with huts or tukl-s for other relatives or retainers (see discussion in McGregor 2001, 94). The evidence of this structure and that of several of his predecessors suggest some kind of link between the Fur and the legendary Tora that survived the architectural innovations introduced during Tunjur rule. Prison of Kurru, Turra Another feature of some Fur royal compounds is the presence of immense lined grain-pits, probably fashioned after a similar pit found at ‘Ayn Farah. Local traditions always identify these pits as “prisons,” though there is no evidence to support this (Figure 6). It seems unlikely, in any event, that a royal residence would incorporate a fetid pit of unhappy captives at its center. This attribution likely has its roots in the Fur Sultans’ practice of placing rivals and officials who had incurred the Sultan’s displeasure in solitary confinement in the sealed darkness of deep rock clefts in the Jebel Marra Mountains for a period of months or even years. Figure 5. Plan of Palace of Sultan Sulayman Solong at Jabal Nami. Figure 6. Plan of “Prison” of Sultan Kuru at Jebel Forei. Gogorma Palace As the Fur kings began to build their palaces and fortresses further west along the wadis leading to Wadai, the buildings began to take on new rectangular forms, probably due to the importation of Bagirmi architects from southern Chad, thought the use of red brick and a massive dry-stone revetment to level the hill recall earlier Tunjur innovations (Balfour Paul 1955, 24, fig. 8). The Bagirmi were known as builders in the great Kanem/Bornu empire of southern Chad and northern Nigeria. significantly from the brick works of Christian Nubia (Figure 7, Plates 5 and 6). 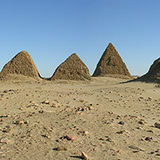 The familiar Tora construction methods that had characterized buildings in Darfur for centuries had largely been abandoned by the late 17th century. Plate 6. Interior of the Shoba mosque. Plate 7. Ruins of the Sultan’s Palace, Shoba. Figure 7. Plan of the Shoba mosque. The Shoba palace was an imposing three-storey, 40-room edifice, with an elaborate ring of defensive walls (Plate 7). According to one tradition, Sultan Muhammad Tayrab went into seclusion here for one year in the mid-1700s, taking with him 365 wives and concubines for company and 365 rams for his dinner. The mosque is similarly large and impressive. Plate 8. Tomb of Sultan Sulayman Solong at Turra. rest of the Sudan, but in Darfur they are used exclusively as royal tombs, perhaps influenced by local concepts of a “divine kingship” that had survived the transition to Islam. Figure 8. Shoba: 1. Plan of the large palace; 2. System of stone-walled enclosures. such as Bornu, Kanem and Bagirmi, or the northern regions now known as Tunisia and Libya. These influences, however, tended to be assimilated into the existing local cultures of Darfur rather than taking a position of dominance over local beliefs and traditions. The late survival of pagan beliefs in Darfur helps give us some idea of what indigenous religion in Sudan was like before the arrival of Islam, and before that, the arrival of Egyptian religious influences in the Nile Valley. The oral traditions of Darfur are also valuable historical and mythological resources, but the destruction and cultural disruption of recent years may mean it is already too late for their systematic collection. Hopefully this fate will not be shared by Darfur’s material remains, which may yet yield a new understanding of the importance of Darfur’s indigenous culture and its historic relations with its neighbours. Plate 10. Kakr (Royal Chair) of the Fur Sultans. Sudan & Nubia 1000-1750: Problems in historical reconstruction. BAR Int. Ser. 1006. Oxford. MacMichael, H. A. 1912. The Tribes of Northern and Central Kordofan. Cambridge. MacMichael, H. A. 1922. A History of the Arabs in the Sudan and some account of the people who preceded them and of the tribes inhabiting Darfur, (2 vols). London. Musa A. ‘Abd al-Jalil and ‘Abd Allah A. Khatir 1977. Al-turath al-sha’bi li qabilat al-fur. Khartoum. Nachtigal, G. 1971. Sahara and Sudan (4 vols). London. O’Fahey, R. S. 1980. State and Society in Darfur. London. O’Fahey, R. S. 2008. The Darfur Sultanate: A History. New York. O’Fahey, R. S. and J. S. Spaulding 1974. Kingdoms of the Sudan. London. Palmer, H. 1928. Sudanese Memoirs (3 vols). Lagos. Shuqayr, Na’um 1903. Ta’rikh al-Sudan al-qadim wa’l-hadith wa jughrafiyatuhu. 2 vols. Cairo. al-Tunsi, Muhammad ibn ‘Umar ibn Sulayman 1845. Voyage au Darfour. Paris.